There’s an obvious context to Malusi Gigaba’s reappointment as Minister of Home Affairs: this was the office from where, in January 2016, he facilitated a Gupta-aligned takeover of the Oppenheimer’s seven-star VVIP airport terminal at OR Tambo International. KEVIN BLOOM lays out the intricacies of the case, leading to the point where President Cyril Ramaphosa sets the perfect trap. “This submission is palpably untrue,” she said. Malusi Gigaba, in other words, was lying. “These letters and conduct in the direct aftermath of the meeting (are) completely destructive of the minister’s version,” she said. In the same paragraph, the judge noted that “the objective evidence does not sustain (the minister’s) argument.” In paragraph 29 of the judgment, referring to the minister’s testimony, she added, “(His) statement, under oath, is incorrect.” Paragraph 30 contained the phrases “nonsensical” and (again) “palpably untrue.” And then, in paragraph 32, the judge pronounced her decision. Her judgment may have been awash in acronyms, but everyone in the courtroom that day knew what the judge was saying. Essentially, after years of battle and tens of millions in legal costs, the North Gauteng High Court had granted the Oppenheimer family the right to run international flights out of their seven-star VVIP terminal on the far side of the apron at OR Tambo. Henceforth, if Bono or Bill Gates or Africa’s various presidents didn’t want to wait in line at the old customs facility, they wouldn’t have to — the FBO (fixed-based operation; a non-plush term to denote the world’s plushest airport terminals) had been given the go-ahead by a High Court judge, and the BCOCC (Border Control Operational Co-ordinating Committee; a division of the South African Revenue Service) would have to comply. Which would’ve been the end of it, had this case — the matter of Fireblade Aviation PTY Ltd versus the Minister of Home Affairs, Director-General of Home Affairs, South African Revenue Service, Denel SOC Ltd, Airports Company South Africa SOC Ltd (and others)—not been at the very core of South Africa’s state capture narrative, and especially Gigaba’s attempts to disavow his own role in the saga. At 9.30pm on 8 November 2017, with SARS and Department of Agriculture, Forestry and Fisheries officials waiting at the Fireblade terminal to oversee its maiden international flight, an application for leave to appeal came through from the Department of Home Affairs. The flight was cancelled, and the Oppenheimers were forced to throw more of their money at the problem. Having already hemorrhaged a fortune on the operational and legal fronts, paterfamilias Nicky and his son Jonathan had no option but to file papers asking the court to “sanction the enforcement of the order of 27 October” pending the outcome of the appeal. Which was just as well, because in the next two weeks both SARS and Denel would join the DHA’s leave to appeal. Clearly, unsurprisingly, by this point boringly, the agents of state capture were not about to give up. Of course, in early December, with the legal papers flying back and forth, none of the protagonists knew what was about to unfold at the ANC elective conference. And nobody, not even in their wildest post-Gupta dreams, could’ve guessed that late in the evening of 26 February 2018, for reasons known only to himself, South Africa’s new President Cyril Ramaphosa would decide not to fire Gigaba — instead, the snappiest dresser in local politics would be deployed from the finance ministry back to his old haunt, the ministry of home affairs. From where, after all, he had facilitated the capture of the R250-million airport terminal for a company aligned to the Guptas. So were the protagonists in this story still going around in circles, or was there some forward momentum? Evidently, any attempt to answer this question would need to return to the scene of the crime. As intimated by Judge Potterill, the key date in these events, the date that Malusi Gigaba wishes to erase forever from his memory, the date that he lied about under oath, is 28 January 2016. On that day, a Thursday, when Gigaba was still serving his first term as minister of home affairs, a meeting was held at his offices at 909 Arcadia Road, Pretoria. In attendance from the DHA, aside from the minister himself, was the deputy director-general Jackie McKay, the deputy general of special projects Kayakazi Dasi, the director of research Lionel Isaacs, and the acting chief of staff Nobuhle Mazibuko. The Fireblade contingent was represented by Nicky Oppenheimer, the company chairman, and Bruce Tillim and Robbie Irons, both company directors. After four years of effort and countless negotiations with all the relevant government departments and agencies, the Oppenheimers had reached the promised land. Minutes of the meeting record confirmation to Fireblade, from Minister Gigaba, that he had signed his approval of its customs and immigration application. Nicky Oppenheimer invited Gigaba to attend a formal opening ceremony at a future date, and Gigaba in turn asked that an invitation be extended to President Zuma. In the following weeks, DHA officials readied the BCOCC and paid a visit to the Fireblade terminal to compile a check-list for international flights. Then, on 5 February 2016, on the back of a letter he’d received from Denel’s chairman, Gigaba suspended his approval “until further notice”. But, as Daily Maverick reported at the time, the paterfamilias was being disingenuous—he knew exactly what had happened. The answer was written in the press pack that Fireblade had prepared for the journalists: “During the last quarter of 2015… Denel SOC formed a joint venture with VR Laser Asia.” This Hong Kong letterbox company, as every journalist in the Fireblade boardroom knew, was wholly owned by Salim Essa, a business partner of the Guptas, and was an associate company of VR Laser Services, a South African heavy duty steel-cutting company in which Rajesh Gupta and Duduzane Zuma, the president’s son, held a stake. Also, through Iqbal Sharma, who had passed lucrative sub-contracts onto VR Laser Services when he was the chairperson of Transnet’s board tender committee, there was a direct link to Gigaba — Gigaba had tried (but failed) to get Sharma appointed to the Transnet chairperson post in 2011. So here’s the key fact: in January 2016, around the time Gigaba was telling Nicky Oppenheimer that he’d soon get his wish, Denel acting chief executive Zwelakhe Ntshepe announced the formation of Denel Asia, an international armaments company whose ownership split was 51 percent to Denel and 49 percent to VR Laser Asia. Denel Asia’s directors, as revealed by Amabhungane, were Ntshepe himself, Ajay Gupta’s 25-year-old son Kamal, a lawyer for several Gupta-linked companies by the name of Pieter van der Merwe, and the CEO of Denel Land Systems, Stephan Burger. Denel, Fireblade’s landlord at OR Tambo International, and the DHA, Fireblade’s chief governmental overseer, now had to come up with an excuse for reversing the announcement of 28 January 2016. What they decided to tell Fireblade was that the company, although it had been operating domestic flights for a few years already, did not have the proper security clearance to run an international customs service. Which would turn out to be magnificently ironic, because in April 2016 a Gupta business jet tried to leave the Fireblade Aviation terminal with a box full of diamonds: a Fireblade X-ray scanner detected the contraband inside a suitcase, a Fireblade security officer inspected the contents of the suitcase, and a Fireblade employee immediately reported the incident to the relevant authorities. It was an event that got the country thinking: the impetus for capturing Fireblade Aviation might’ve been that it was the perfect facility from which the Guptas could send things—diamonds, small arms, cabinet ministers—out of South Africa in a rush. And with this as the unstated context, Judge Potterill, who had already hammered Gigaba, was not about to spare Denel in her judgment of 27 October 2017. “The volte-face of Denel is inexplicable and irrational and cannot negate the minister’s decision to grant approval of the FBO,” she said. What South Africa had in Judge Potterill, it appeared, was a jurist with a healthy taste for the absurd. But the DHA’s first appeal of Potterill’s decision was scheduled for 14 December 2017, when the absurd would turn into the constitutionally scandalous. “By telling a deliberate untruth on facts central to his decision in this case, (Minister Gigaba) has committed a breach of the Constitution so serious that I could characterise it as a violation,” said Judge Neil Tuchten. The judge then gave Fireblade permission to go ahead with international flights, stating that “the minister should not be permitted to perpetuate the injustice by continuing to frustrate the applicant” on an appeal that could take “one to two years” to finalise. And yet still, Ayanda Dlodlo, the minister of home affairs at the time, did nothing to comply with the court order—according to the Oppenheimer lawyers, she “did not even see it fit to meet with Fireblade”. So another court date was set down for 27 December 2017, this time to hold the minister and director-general of the DHA in contempt for not effecting Potterill’s decision. Rather than go to prison, the DHA chiefs agreed to render the immigration services to Fireblade while, at the same time, Gigaba took the Potterill judgment on further appeal to the Constitutional Court. At operational losses approaching R400-million, Fireblade Aviation welcomed its first international flights in mid-February 2018. 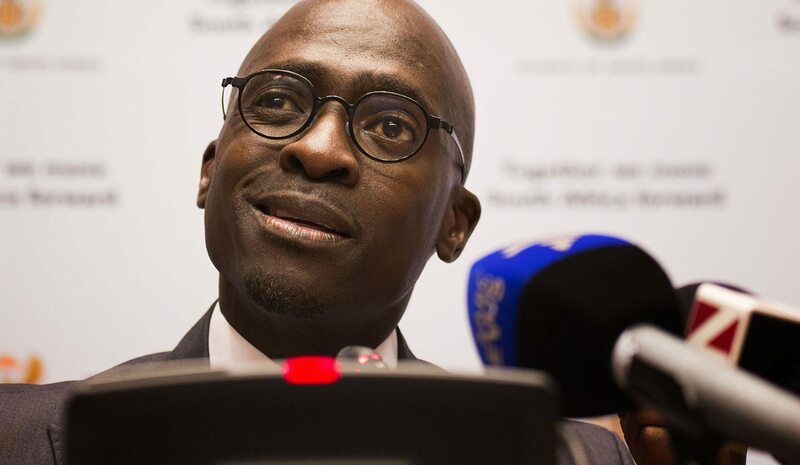 The following week, on 21 February 2018, as he was delivering his maiden budget speech as finance minister, Malusi Gigaba was heckled in Parliament by the Democratic Alliance. “How the hell can we believe you?” asked DA MP Lindy Wilson. Just before the speech, DA chief whip John Steenhuisen had tried to convince speaker Baleka Mbete to hear a substantive motion against Gigaba for telling “untruths under oath” on the Fireblade matter. The motion was, of course, denied, but the DA had earlier that morning lodged a complaint with the Public Protector—the party demanded that Busisiwe Mkhwebane investigate Gigaba for breaching the Constitution, the Executive Members’ Ethics Act and the Executive Ethics Code. And then, five days later, President Ramaphosa moved Gigaba back to his old office in the DHA. There had been no reaction from the new State President as he listened to this person, this Gupta-aligned Cabinet minister deemed a liar by two High Court judges, read the all-important budget speech. Was Ramaphosa thinking about what he was going to do? Did the idea come to him then that the simplest way to crush Gigaba would be to return him to the site of his primary transgression? If so, it was a masterful plan. When he awoke on Tuesday morning 27 February, it’s likely that Gigaba had two conflicting thoughts in his mind: a) I’m still a cabinet minister, b) Damn those Oppenheimers to hell. Photo: Finance Minister Malusi Gigaba addresses the media prior to the much awaited Budget speech in Parliament on 21 February 2018. Photo: Leila Dougan.